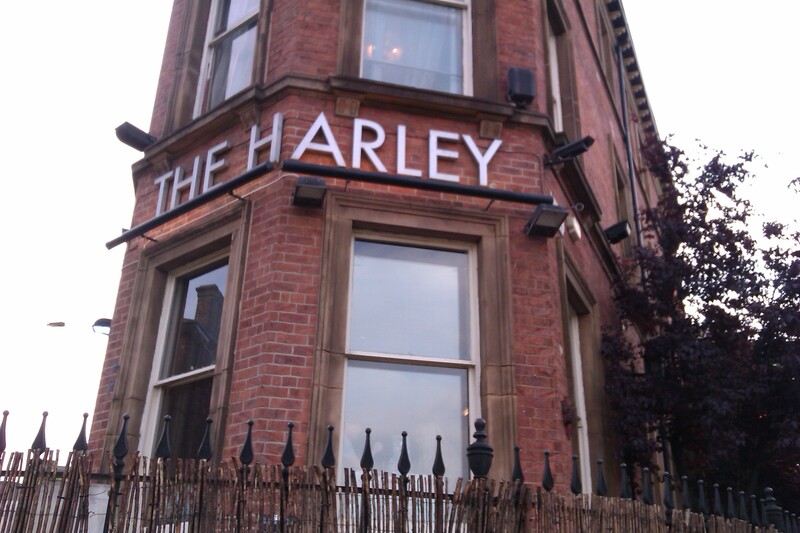 With burgers and bevvies on the brain, we headed to The Harley. 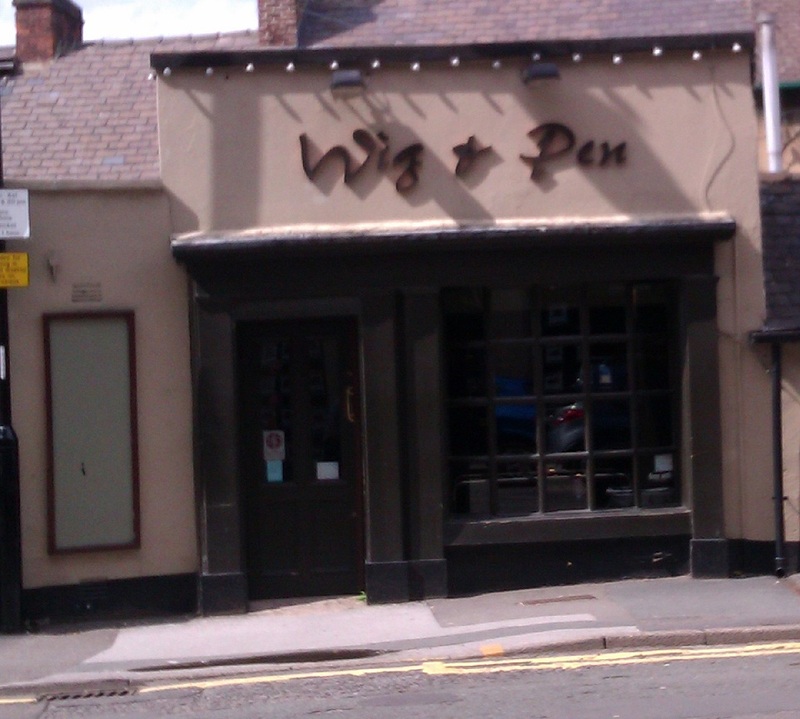 Located on Glossop Road, this student-friendly place is well known as a music venue, but this weekday evening the stage was covered up and a handful of tables were dotted around the dancefloor. First impressions weren’t fantastic – there’s a grand total of three tables, plus a couple of sofas tucked away in the corners. The lack of seating won’t be a problem at the weekend or when a band is playing, but on this quiet weekday evening the place felt bare, and sat on an island of a table in the middle of the dancefloor was an odd experience. 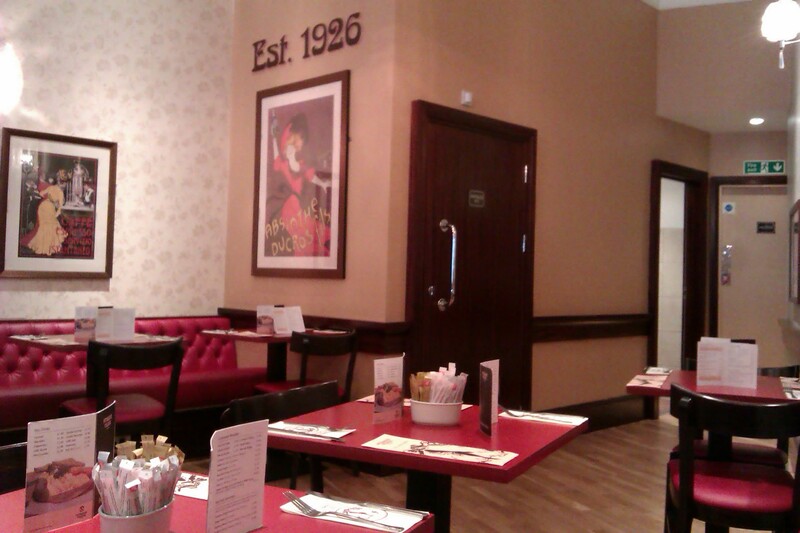 It’s a shame, as the place has funky decor that isn’t far removed from the cosy and welcoming The Wick at Both Ends. Unusual lighting, graffiti art on the walls and tablecloths printed with scenes from comic strips, all give the place a trendy vibe, but without crowds of people around the bar or the stage, it feels really empty. The quirky menu also takes a leaf out of the Wick’s book – burger fans can order a ‘Moist Maker’ (“Sunday roast in a burger”) the ‘Ring Stinger’ (“the hottest burger in town”) or a deep fried burger (apparently, “you know you shouldn’t, but you just can’t help yourself.”) Even the menu layout is similar to the Wick’s. As tempting as the burger menu was, we decided to plump for the budget option and ordered a no-frills beef burger with a pint of Becks (£5.50) and for me a bean burger with a pint of – what else? – Gaymers (also £5.50.) The burgers took longer than expected to arrive, but with our drinks already lined up we were only too happy to wait. When the waitress finally brought our burgers over, first impressions were good. Each burger came with a plastic tub full of french fries, which was an unexpected bonus, and were oozing with salsa and salad. Too often, veggie alternatives feel like an afterthought, so I was delighted to see that my bean burger was almost twice the size of its meaty counterpart (ha!) As I tucked in, I quickly discovered this wasn’t just a bean burger – it was a seriously spicy bean burger. The delicious, kidney-bean packed burger already packed quite a punch, but the chef had also thrown lashings of fiery salsa into the mix, a double whammy that left my tongue flaming. 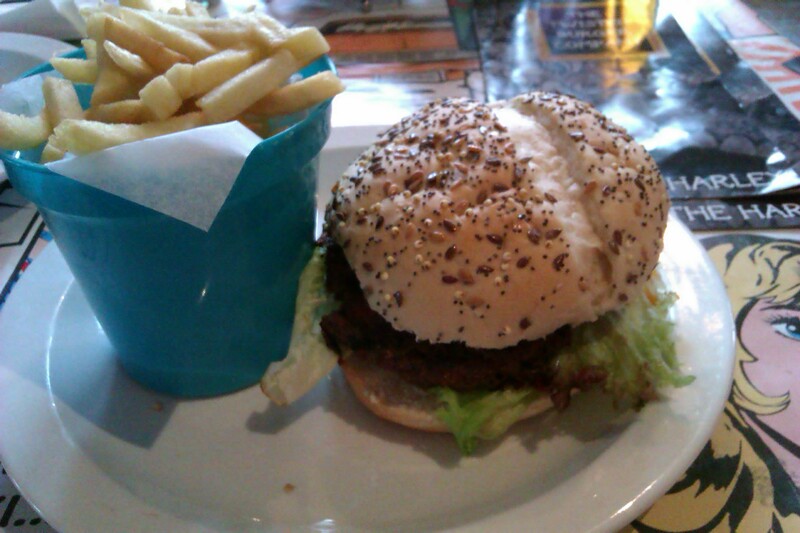 Beware, this burger is not for the faint hearted, but I have a soft spot for spicy food and wolfed down every morsel. Highly recommended, for those who can take the heat! The meat equivalent was equally filling, it came without salsa but still had a pleasantly peppery kick, although our reviewer found a few lettuce leaves in the bun that were turning brown at the edges – not very appealing! The french fries, although a welcome surprise, were the standard fare you could defrost and cook for yourself at home. 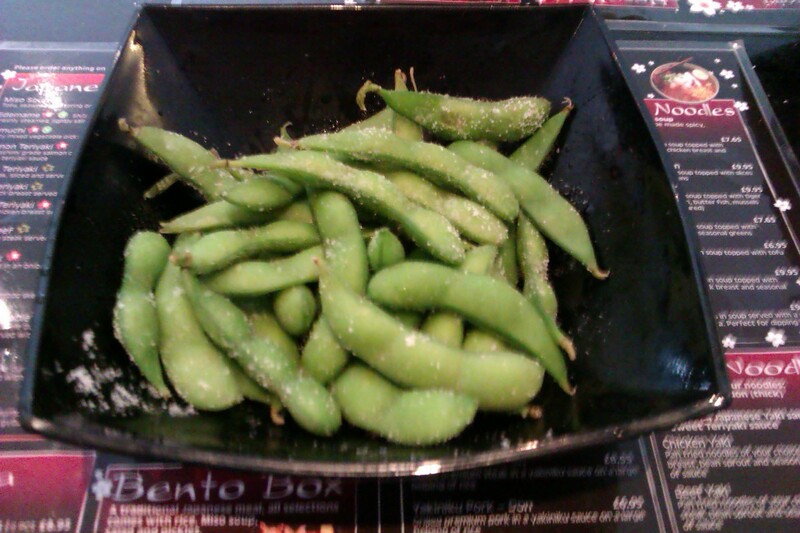 We also agreed they were too salty, and our cynical brains decided this was a ploy to get you heading back to the bar. 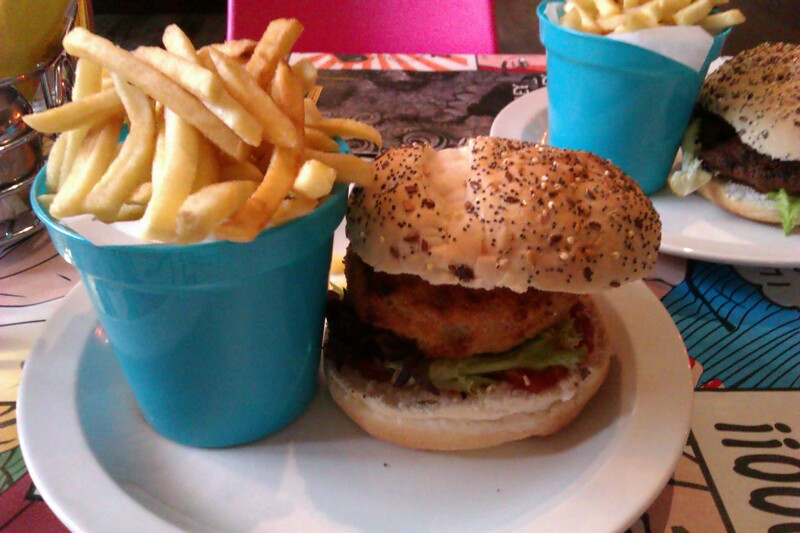 A budget venue – but, if you don’t mind the grotty toilets, then this is a real find for burger lovers. 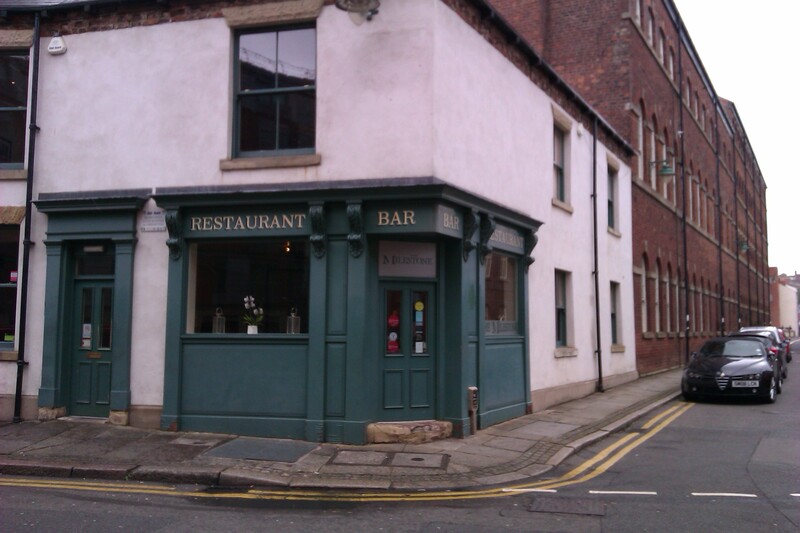 Despite only ever hearing good things about gastro pub The Milestone, it turns out no-one at Sheffield Eats has actually gotten around to trying it for themselves. Tucked away in a particularly industrial corner of Kelham Island, it’s not a place you’re likely to wander past and decide to pop in. Because it’s off-the-beaten track, you have to make a conscious decision to visit. 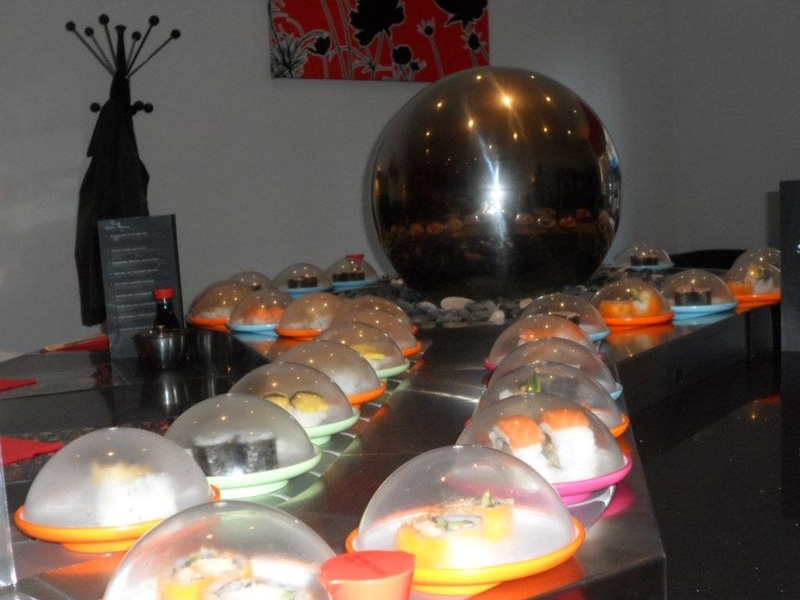 With so many fantastic eateries lined up in the town centre, is it really worth making a special trip to The Milestone? Judging by the meal we had there this weekend, the answer is a resounding yes. Located just off Shalesmoor roundabout, The Milestone is perched on the corner of a nondescript road, surrounded by a mish-mash of factories with bricked-up windows and swanky new apartments. 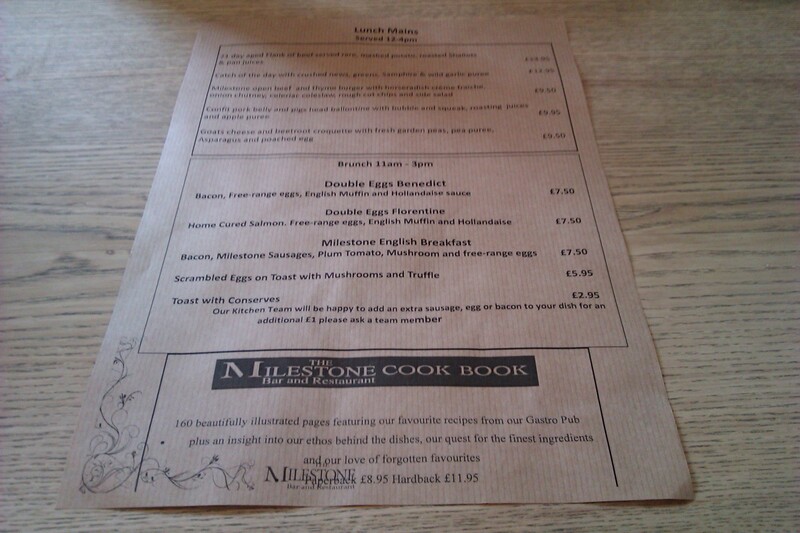 We were advised to book a table for The Milestone’s Saturday lunchtime menu, and it’s a good job we heeded that advice, as by 2PM the place was full. Clearly, there’s no shortage of foodies willing to make a special trip for their lunch. The Milestone’s decor is a blend of clean, white open space and rustic charm, with plenty of homely prints on the walls and quirky flourishes, such as The Milestone’s twisty staircase and menus printed on fish-and-chip shop brown paper. 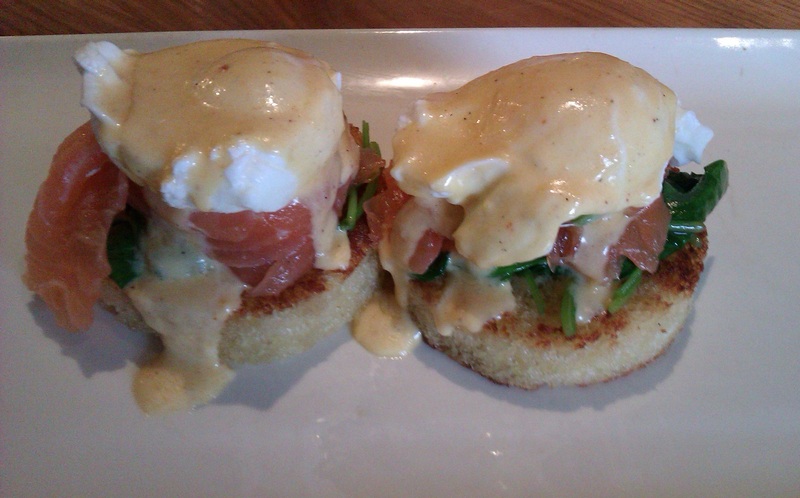 It’s a pleasant atmosphere that’s completely unpretentious, despite the extravagant menu. Obviously, the menu isn’t going to be to everyone’s taste. It’s not a million miles removed from haute cuisine, with each dish offering an intricate and thoughtful balance of flavours. It’s the sort of menu where unusual purees, jus and dressings feature heavily. The fish comes with samphire and cauliflower puree, and the 21-day aged beef is served one way: rare. Excited to discover what had drawn so many people to The Milestone for lunch, I quickly ordered the goat’s cheese and beetroot croquette, which came with fresh garden peas, pea puree, asparagus and a poached egg (£12.95). It arrived at the table meticulously presented but, cynical and hungry, I was dubious whether this daintily-arranged platter could fill up my rumbling tum. How wrong I was! 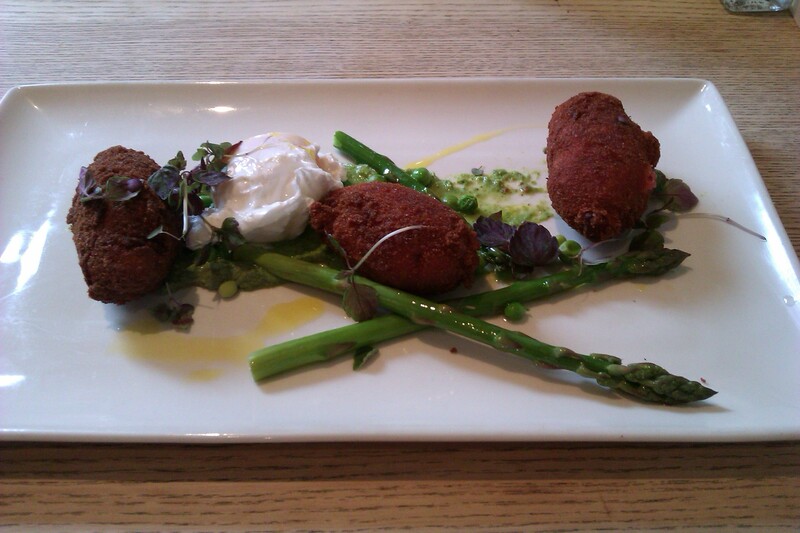 The croquettes were stuffed with smooth goat’s cheese and the pea puree was unexpectedly creamy. A few bites in and I went from eyeing up the dessert menu, to wondering whether I’d be able to clean my plate. Although I knew the goat’s cheese croquettes were made with beetroot, I was still surprised when I cut into the first one and was confronted by a bright pink filling. The colour might be off-putting to some, but I was left wondering why I’d never stumbled across this combination before; the beetroot gave the heavy cheese a real zing. Asparagus can be a tricky vegetable to get right, but The Milestone got it spot-on; it was cooked through without being soggy. Even the salad leaves dotted around the plate had been carefully selected to compliment the rest of the meal; they were delicious mixed up with a forkful of pea puree and runny egg yolk. 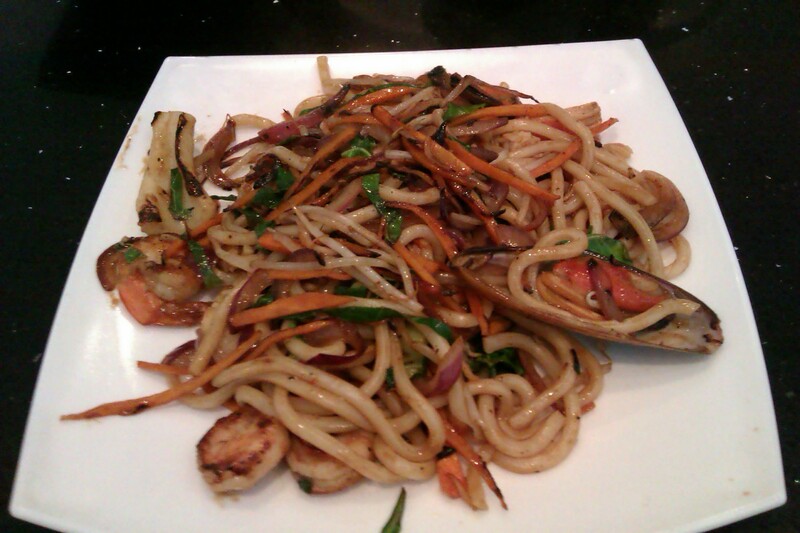 An ingenious and expertly put-together plate of flavours and textures, presented with the utmost care. Despite the expert attention to detail, the goat’s cheese and beetroot croquette was still a real gut-buster that left me too stuffed for pudding, and grateful that I hadn’t ordered a starter. 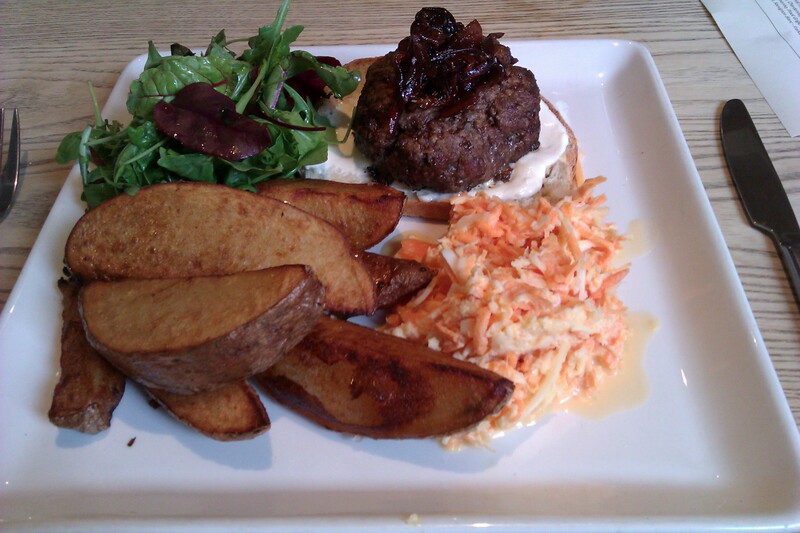 We also ordered The Milestone’s take on the humble burger: an open beef and thyme burger served with horseradish crème fraîche, onion chutney, bread, celeriac coleslaw, rough cut chips and a side salad (£9.50). In contrast to my delicate-looking veggie option, this very upmarket-sounding burger turned out to be an impressive pile of grub. The beef and thyme meat patty tasted like no burger our reviewer had been served before. A slab of high-quality, perfectly cooked meat, they raved that it was the best burger they’d ever crossed paths with. The crème fraîche, onion chutney and tangy celeriac coleslaw were inspired accompaniments to this fine hunk of meat. The skin-on chips were served already seasoned with cracked sea salt and vinegar, and as someone with a fondness for skin-on chips, our reviewer was left vowing they’d never eat a french fry again. Crispy and rustic on the outside, and as fluffy as a freshly-baked jacket potato on the inside, The Milestone take the humble chip to the next level. Unsurprisingly, wine buffs are well catered for at The Milestone. A whole section of the wine list is dedicated to ‘Fine Wines,’ which range from £31.50 to a bank-breaking £100. If you’re not a big-time wine connoisseur, there are cheaper options. 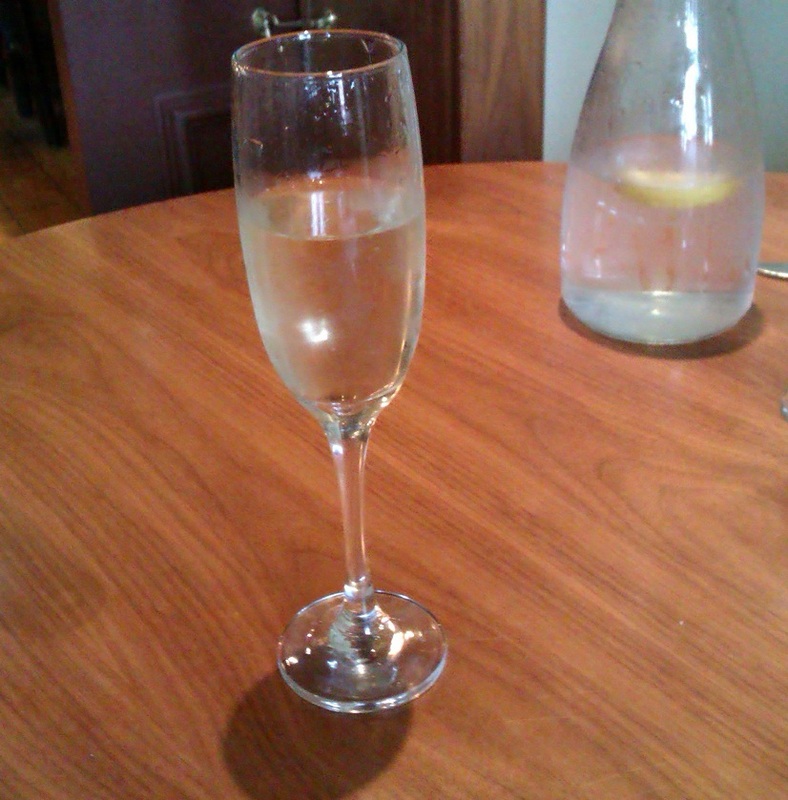 We opted for a bottle of sauvignon blanc at £18.50, which went down a treat. For those who are open-minded about food and who are excited, rather than overwhelmed by a riot of flavours squeezed onto a single plate, The Milestone is for you. 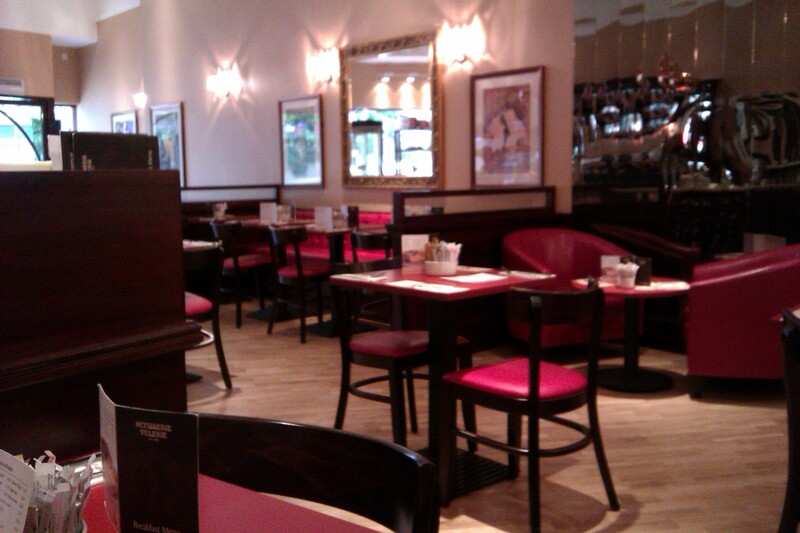 Although this isn’t the sort of place you frequent on a regular basis, a meal here is an experience. A trip to The Milestone feels like a special occasion, right down to the off-the-beaten track location. For a meal out in the hustle and bustle of Sheffield’s town centre, it doesn’t get any better than Leopold Square. With fine italian eateries like Zizzi, Popolo and Strada; posh tapas courtesy of Platillos; flaming hot Aagrah curries; and noodles from Wagamama, the only hard part is deciding where to eat. 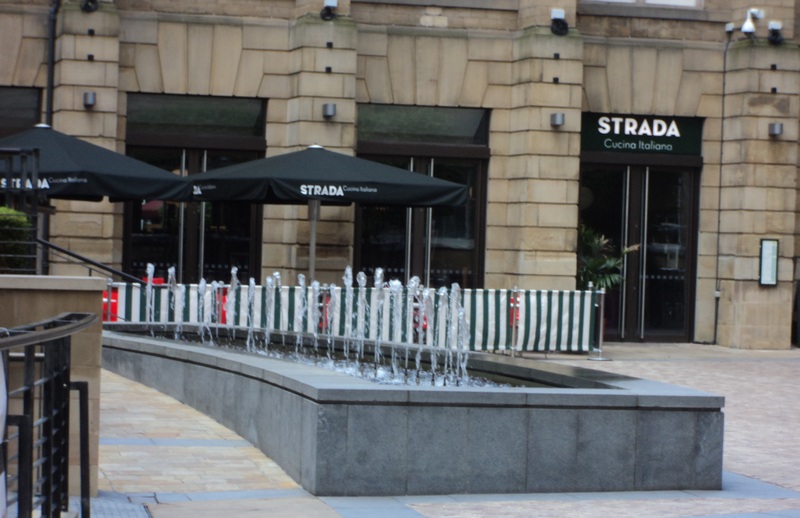 After ASK whet our appetite with its hit-and-miss italian grub, we settled on another italian restaurant this week; Strada. Although there’s enough seating for a few bus loads of people inside, Strada maintains a cosy feel with lots of dark wood and intimate booths. We were escorted to one of the corner booths by a polite and friendly waitress and promptly got the party started with a bottle of white wine (expect to pay between £16 and £27) and a bottle of red (prices range from £16 to a whopping £35). The wine list is sorely lacking budget options (something around the £12-£14 range would be ideal) but taste-wise, we had no complaints about our bottles of pinot grigio (£18.50) and merlot (£15.60). 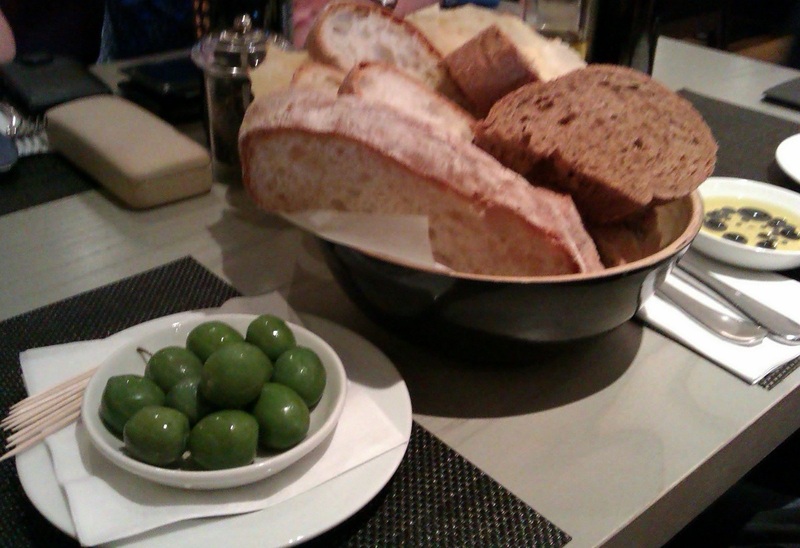 We began our dining experience with a helping of Olive Castelvetrano (that’s green olives to you and me) which were very reasonably priced at £2.50, and a basket of breads (£4.50) with those old italian classics, olive oil and balsamic vinegar for dipping. The bread basket and dipping oils were a massive hit at our table. The waitress was even kind enough to leave us full bottles of olive oil and vinegar so we could dip away to our hearts’ content. At other restaurants, we’ve had the staff dole out a strict ration of oil and vinegar, and inevitably you run out of oil before you run out of bread. The variety and quantity of bread was a pleasant surprise; our basket contained the standard white and brown bread, but also olive bread and crispy pane carasau. Easily one of the best “bread and oil” starters we’ve had in an italian restaurant, and the quantity is perfect for sharing as our bread basket could have comfortably served 4-6 people. At this point, bowls for the waste seafood shells arrived at our table, which made the seafood-lovers amongst us very excited. Any seafood dish that warrants an extra bowl for the shells is always going to be something a little bit special. 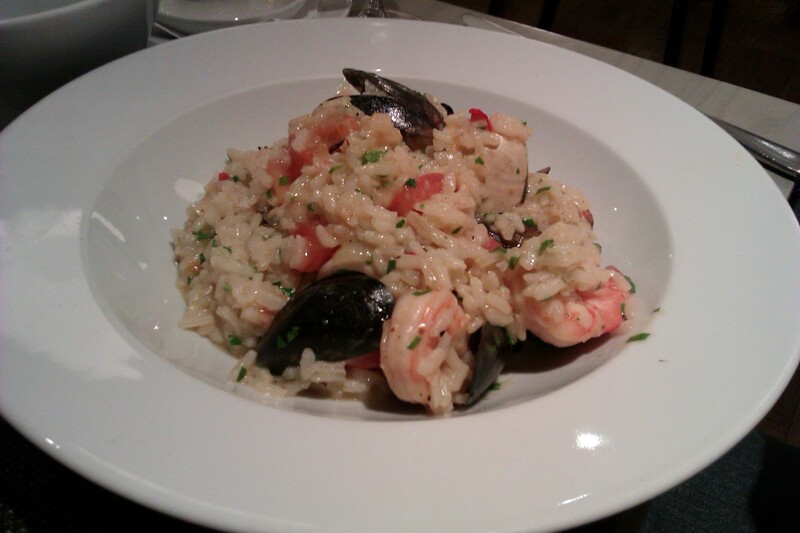 Our seafood bounty included a Risotto Frutti Di Mare (£11.75), a risotto of squid, mussels, prawns and clams. Risottos are reliably rich, but the thick sauce means they’re not always the prettiest of dishes. This seafood risotto was different: a light sauce meant it looked every bit as good as it tasted. Our seafood-fanatic reviewer raved that it was one of the best seafood risottos they’d ever had. Pasta is another italian staple, so we couldn’t leave without sampling Strada’s pasta. 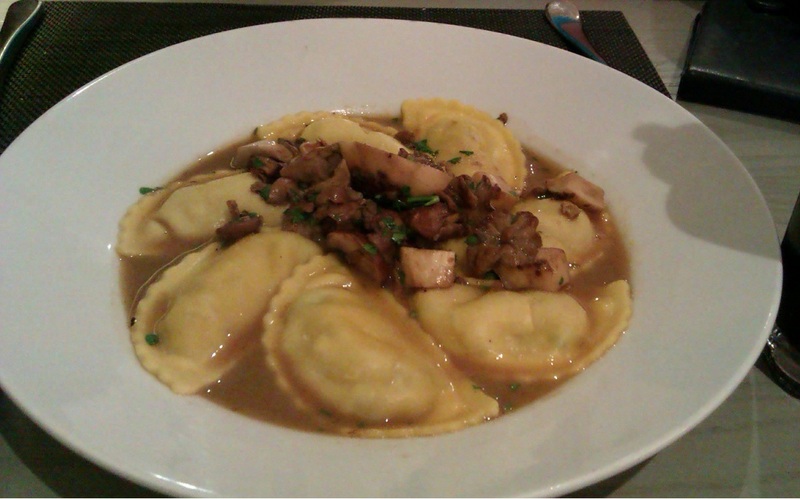 We ordered a Panzerotti Porcini (£9.25), pasta parcels stuffed with a creamy mix of mushrooms, ricotta and provolone cheese and covered in a light broth with a few exotic-looking mushrooms scattered over the top. Deceptively filling, this dish got another big thumbs up, especially the fragrant broth which was a nice contrast to the earthy mushroom pasta. Another pasta dish winging its way to our table was the Spaghetti Ragu (£8.95). The beef, onion, red wine, tomato and herb ragu was perfectly seasoned, and came on a mountain of spaghetti. At just under £9, this is a value-for-money meat dish. But if you’re a seafood-lover, you owe it to yourself to try Strada’s Tegamaccio. 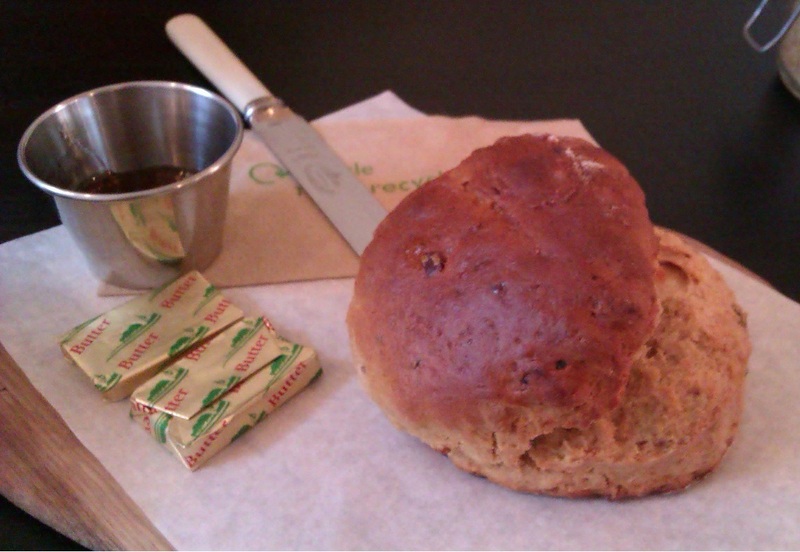 It’s at the more expensive end of Strada’s menu, but it’s worth every last penny of the £14.95 price tag. Essentially a posh fish stew, the tegamaccio boasts a lip-smacking selection of clams, mussels, red mullet, squid, prawns and even a shell-on king prawn. The clams, mussels and king prawn all come in their shells, giving the stew a rustic appearance, especially with the hunks of bread perched on the side of your bowl, ready for dipping. And believe me, you’ll want to dip: the white wine and tomato based soup is heaven. Hearty and satisfying, faultlessly seasoned and packing a real wine zing, I could have drank a bowl of this on its own. In fact, I’d supped half of the soup before I even tried the seafood. When I finally got around to it, the seafood was juicy and tender, even the squid, which is so easy to overcook. There were a few things that prevented the tegamaccio from being perfection on a plate, and one was the burnt ciabatta bread. Even worse, both pieces of bread arrived with the blackest sides turned face down in the soup, which made me wonder whether the burnt bits had been spotted by the staff. There were also capers in the stew, which kept delivering an unexpected squirt of pickled liquid that didn’t compliment the dish at all. Even with these minor quibbles, Strada’s tegamaccio is one of the best seafood dishes I’ve had the pleasure of devouring. 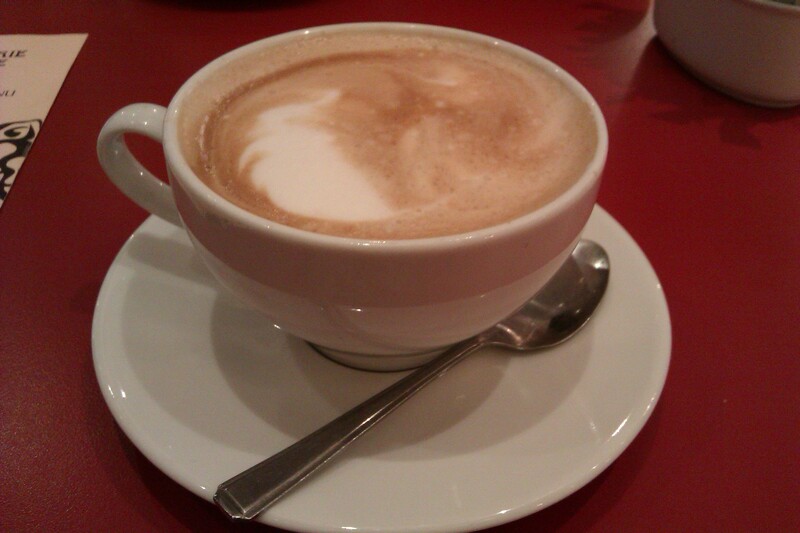 Miraculously after so much top notch grub, we still had some room left, so we ordered a few reasonably-priced coffees (£2.20 for a latte.) 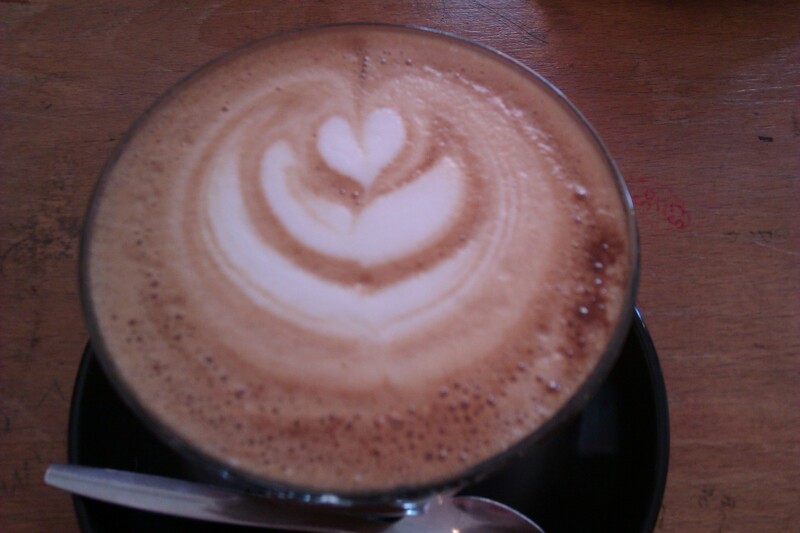 The lattes were smartly presented in neat little glass mugs and white saucers. For the more boozy members of our party, a shot of after-dinner amaretto (£3.20) was on the cards. 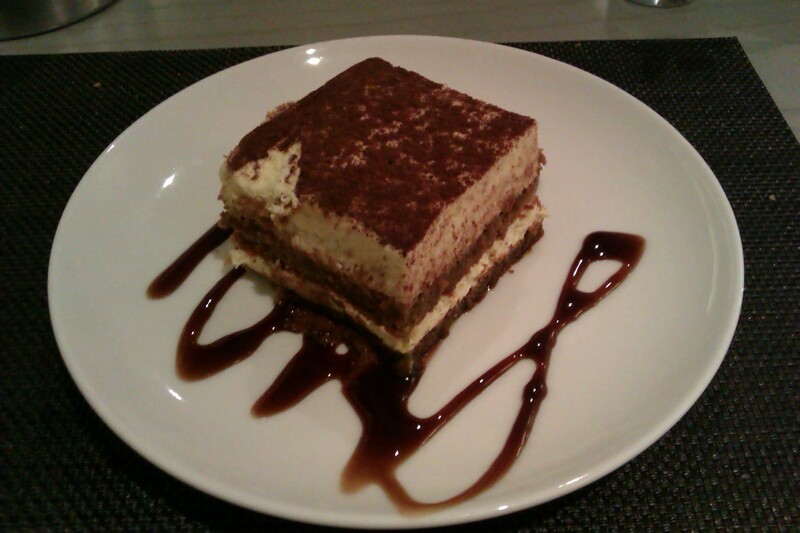 Alongside the drinks, we ordered a portion of Strada’s tiramisu (£4.95). For just under a fiver, Strada plates up a doorstop of caffeine-soaked sponge and mascarpone cream drizzled with sticky coffee syrup. Be warned, this block of cake is not for the faint hearted, and I have no shame in admitting I had to share it with another member of our party. 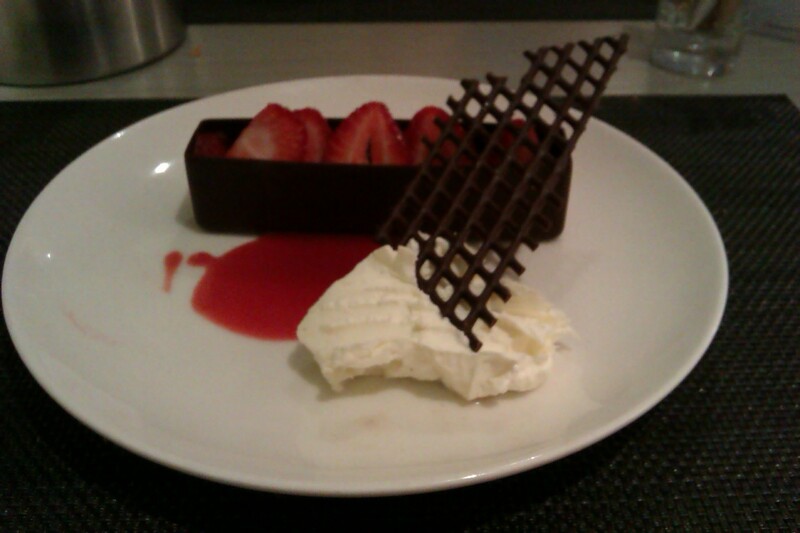 A genuinely indulgent dessert! If you’re craving something a bit more delicate, the Mousse Al Cioccolato (£5.25) is like a work of an art on a dessert plate. A molded chocolate case filled with fluffy mousse and adorned with a row of fresh strawberries, this dessert is finished off with a dollop of cream, a drop of delicious strawberry coulis and a chocolate filigree. 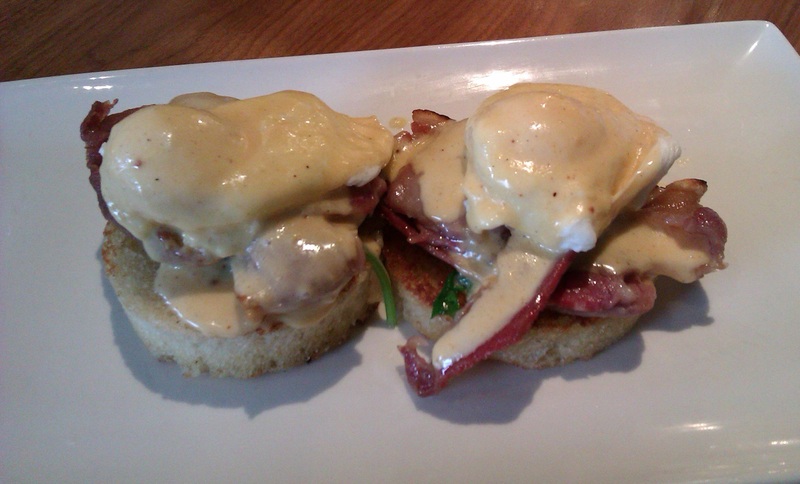 The end result is a treat for the eyes as well as the taste buds. A fussy, fancy dessert that tastes as good as it looks, thanks to some of the most decadent chocolate you’re likely to come across. 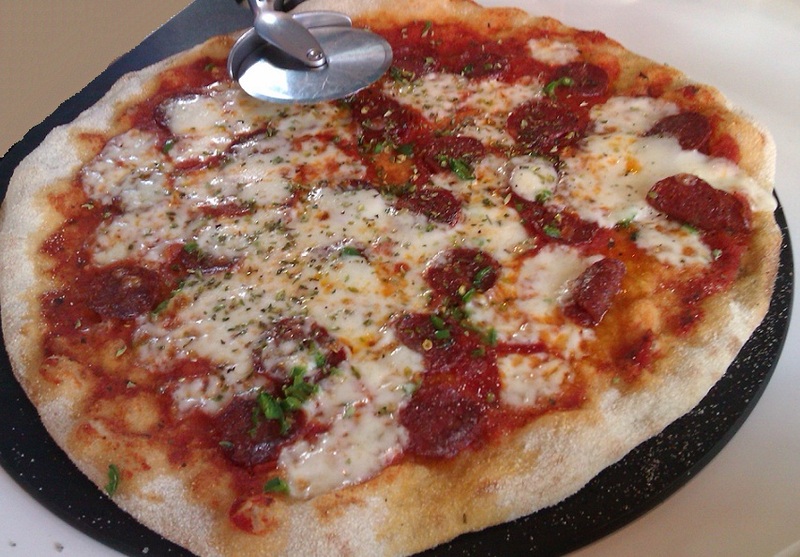 For high street italian food, Strada is a tough one to beat. 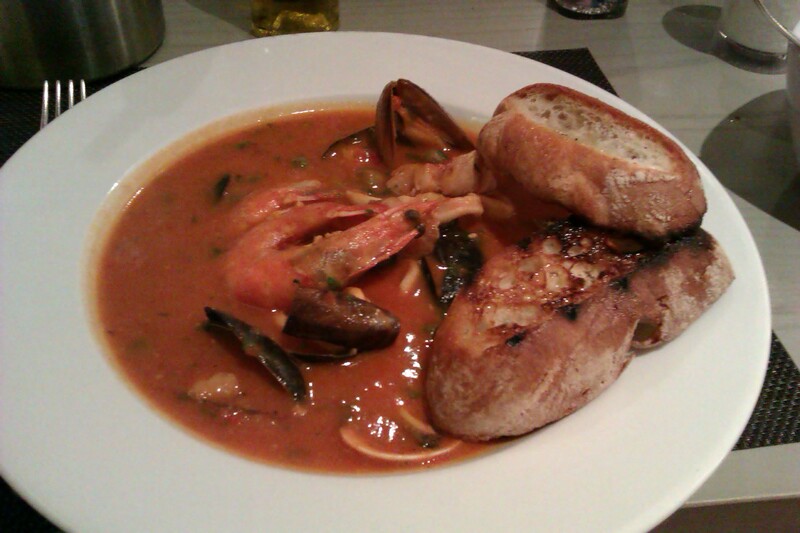 There were a few niggling problems with my fish stew and the wine is expensive and can really push up your bill if you’re not careful, but overall the food was excellent, and the bread basket starter is highly recommended. 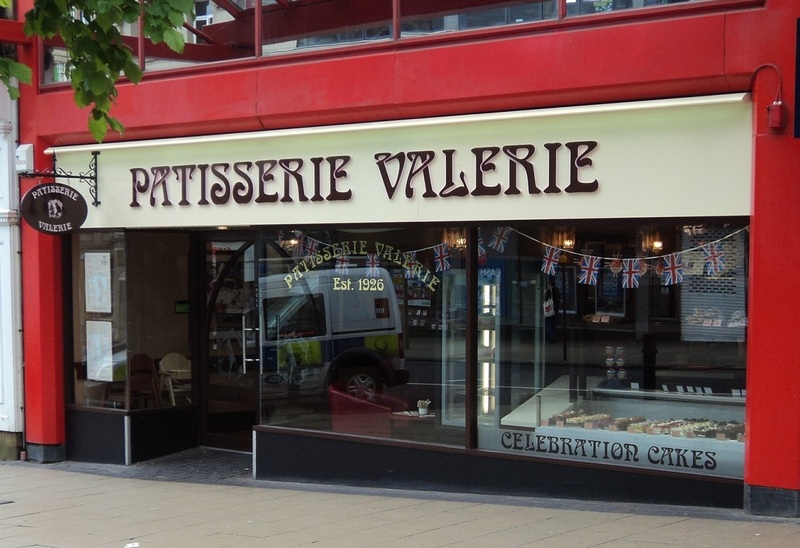 Not a cheap evening out, but for the quality of the food, the convenience of the city centre location and the spacious surroundings, this is a top high street italian restaurant. Remember that heatwave/summer we had last week, before the Curse of the Bank Holiday kicked in and plunged us back into 24-7 drizzle? During one of those rare evenings where you don’t need waterproofs just to go into town, we headed out in search of that old classic: italian grub. 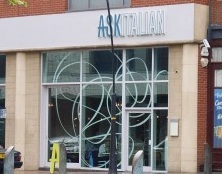 Sheffield has no shortage of fine italian restaurants, and in the end we settled on ASK. Located on Cambridge Street, ASK has some stiff competition from Leopold Square – so how does it stack up against neighbours Zizzi and Strada? Well, unlike the Leopold Square crew, ASK lacks outdoor space, which is only going to be a problem during nice weather. Unfortunately, this was one of the 5 days a year where being outdoors doesn’t require full winter gear. Even though the ASK staff had thrown all the windows open, it was still a few degrees above comfortable inside. Temperature gripes aside, ASK’s big, gleaming open plan interior has a cafeteria feel to it, that doesn’t set the ‘italian restaurant’ mood. Thankfully, ASK makes up for this when it comes to its eye for detail: the wine comes in stylish, gleaming glass carafes and the water jugs have polo-style hand-holes set into the glass. Still a little too warm for comfort, we downed glasses of water while examining the menu. ASK serves the usual crowd-pleasing mix of pasta dishes, pizzas and seafood, all mixed up with plenty of those italian staples: cheese, tomato and herbs. We ordered our meals and switched from water to a carafe of white wine (£10.15 for the chardonnay) while we waited for our food to arrive. 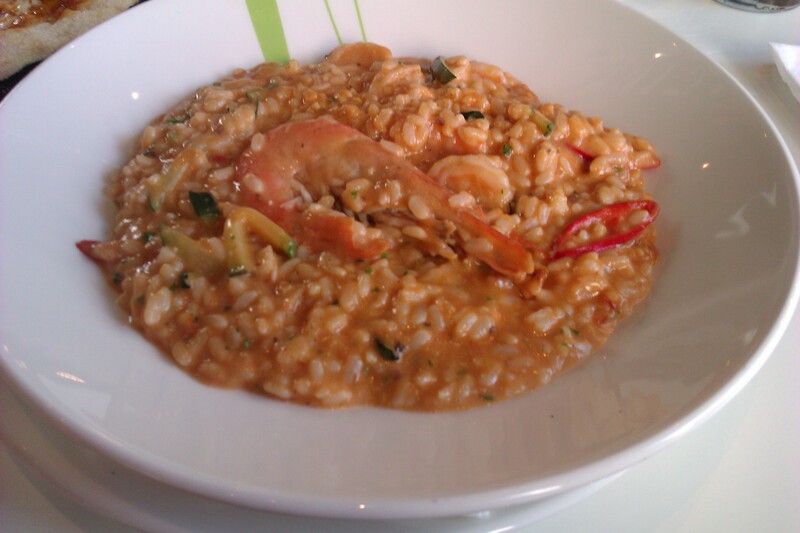 First to appear was a helping of risotto gamberoni (£12.45). The risotto sauce was creamy and layered with tomatoes, prawns and refreshing shredded courgette. The courgettes and rings of red chili were perfect additions; the freshness of the courgette and the fiery kick of the chilis prevented the thick sauce from becoming overpowering. Despite some interesting flavours thanks to the chili and the courgette, I was wondering why a rice dish demanded such a hefty price tag – until I tucked into the single shell-on king prawn that came with the risotto. 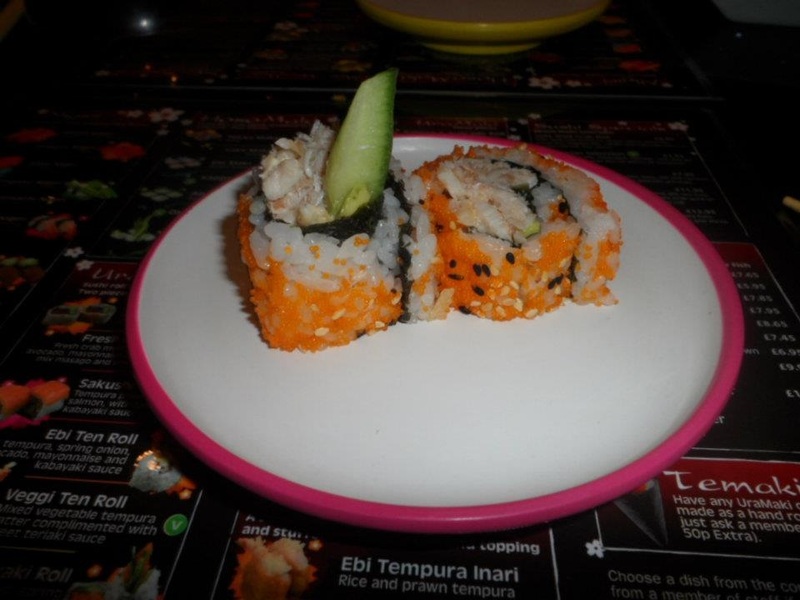 The king prawn meat was as fresh and tangy as sushi, and cooked to juicy perfection. 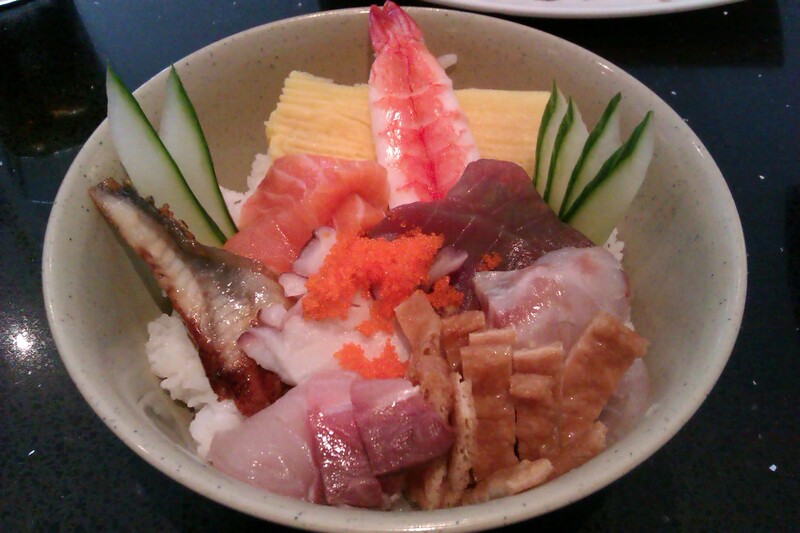 Although I only managed to scrape a few forkfuls of prawn meat from the shell, the price tag suddenly made sense. If I’d been served a plateful of nothing but those king prawns, I’d have gone home raving about ASK. Also shipped to our table, was a Stromboli pizza (£8.95) The pizza arrived rustic-style, on a chopping board with an extra helping of chilis, as requested. Despite the sprinkling of chili peppers, the pizza still lacked a kick and there were complaints of it being too salty. 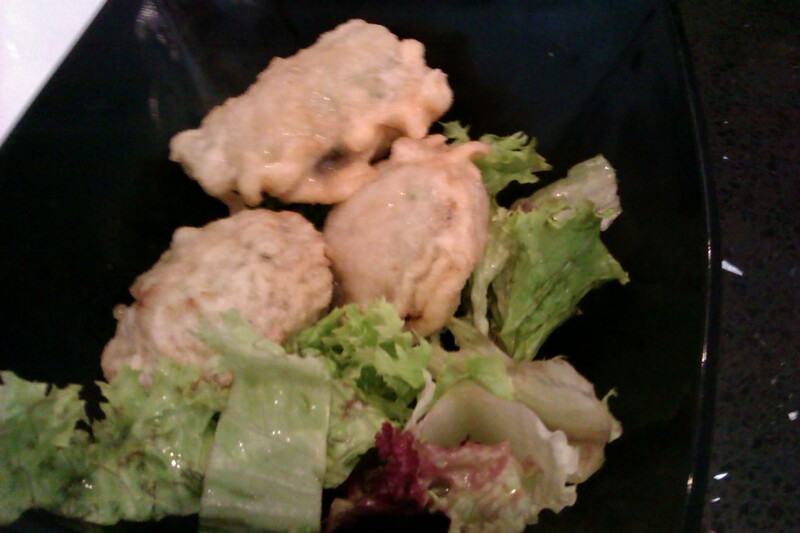 Finally, we were treated to the ravioli marittimo (£10.35). The pasta parcels were jam packed with a creamy mish-mash of seafood: crayfish, crab and salmon, to be precise. Like the rest of our ASK meals, the portion sizes seemed disappointing at first glance, but it’s the sheer richness of the food that leaves you stuffed. Topped with a herby tomato sauce and a few prawns, the ravioli completely finished our reviewer off. 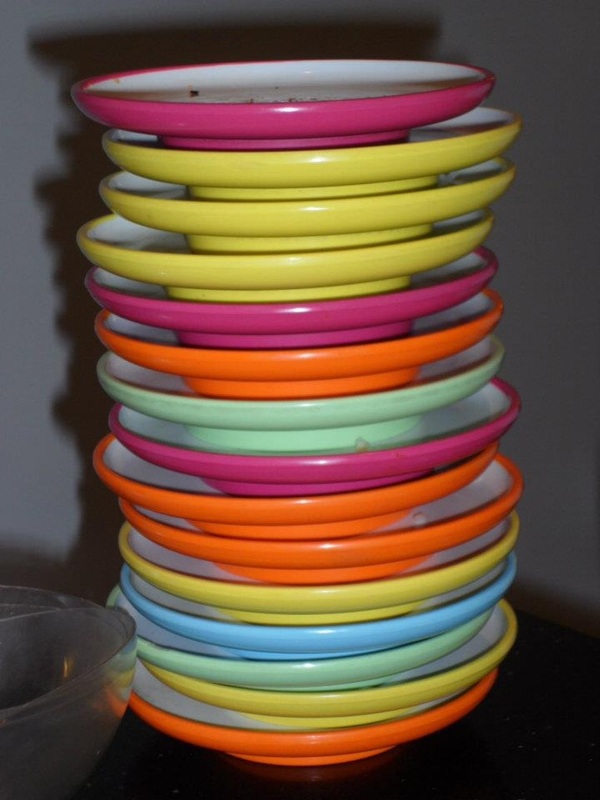 However, we had one major gripe with ASK, and that’s how quickly the food arrived. While speediness is usually a good thing for rumbling tums, it meant we’d ordered and finished our food in under twenty minutes. Paying nearly £13 for a risotto that’s ready in ten minutes leaves you feeling cheated. 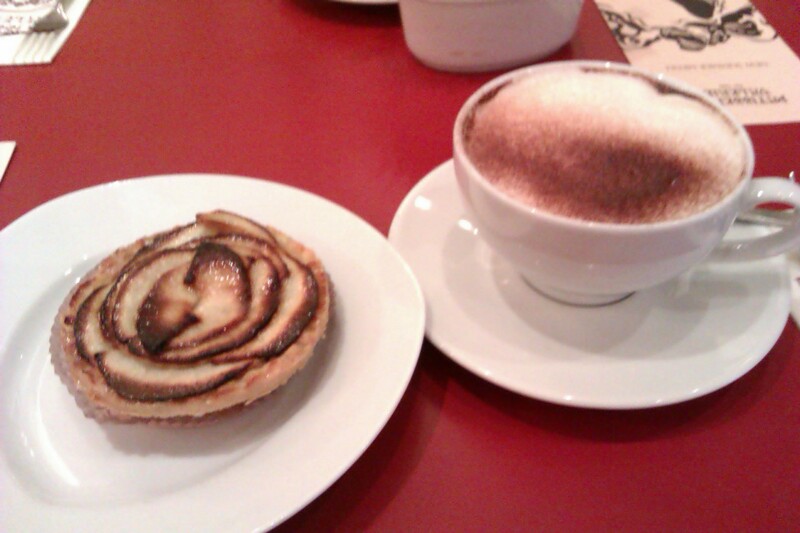 To stretch out our evening, we felt compelled to order a round of hot drinks and some puddings. 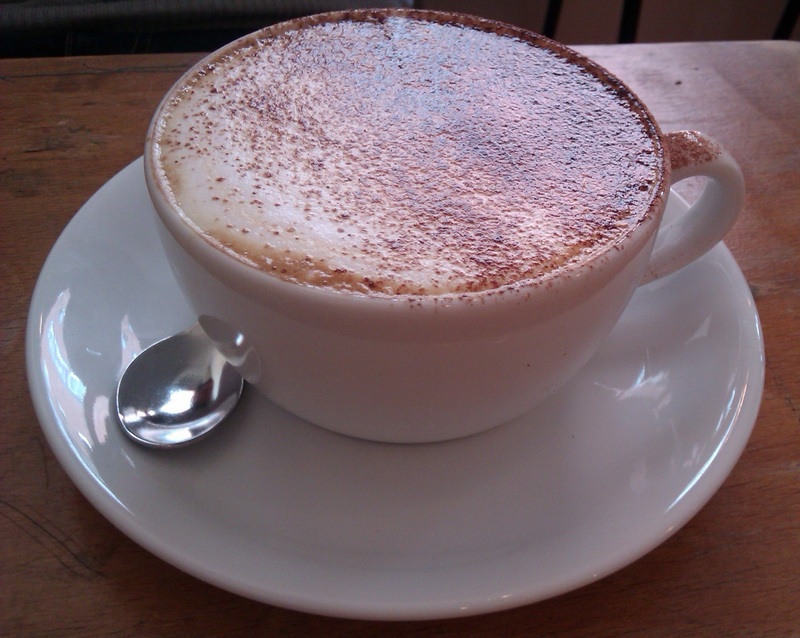 Just like the carafes and quirky water jugs, our lattes (£2.15 each) arrived in style. 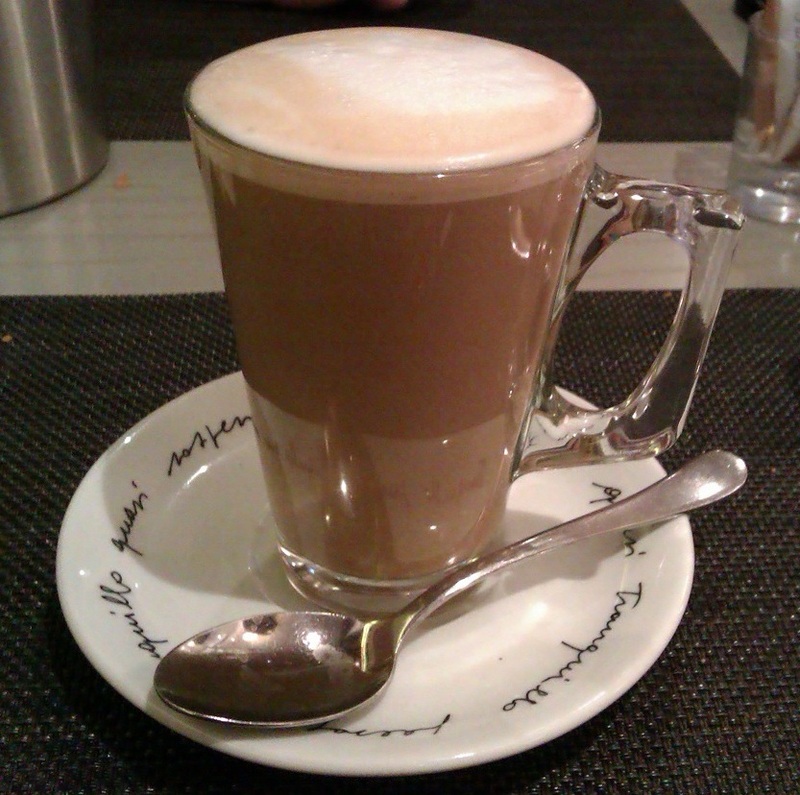 Served in neat glass mugs with silver handles and white saucers, the presentation was faultless. 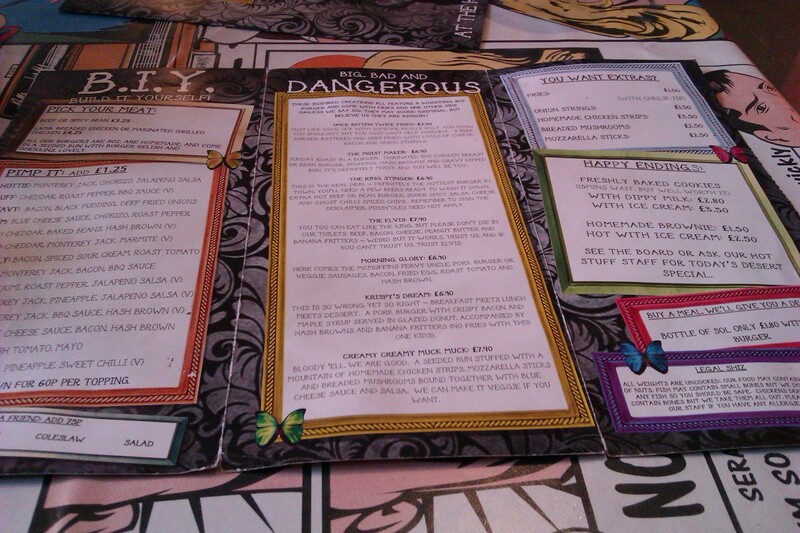 Meanwhile, the honeycomb cheesecake hit the spot, although at £5.25 it was rather pricey for just one slice. Our experience at ASK was a bit of a mixed bag. They certainly know their way around seafood, but the prices are a bit on the steep side, especially for food that arrives in under ten minutes. If you want to make an evening out of ASK, be prepared to shell out for plenty of extras. We were left stuffed, but with the nagging feeling that our evening out was over too quickly.